Looking for some clever ways to use up items around your home? If you have an overflowing stash of toilet paper rolls, Mason Jars, pop cans, water bottles, fabric scraps, and newspapers, this eBook is for you! Filled with tons of creative ways to turn your trash into treasure, this creative crafting guide will help you declutter your home, organize your living space, and even show you how to make your very own home accents using items that are in your recycling bin right now! From simple organizers to beautiful pieces of jewelry, the projects in Trash to Treasure: 28 Recycled Crafts will leave you inspired to find a new way to use everything in your home. Download your free copy of Trash to Treasure: 28 Recycled Crafts today! It’s a no brainer that tin cans make great organizers. Everything from pencils to makeup brushes can be organized and stored in old soup cans. You can even use smaller tuna cans to organize and store jewelry, office supplies, nuts and bolts, and other small materials. There are also hundreds of ways to decorate old aluminum cans to make them more appealing to the eye. With the projects you’ll find in Trash to Treasure: 28 Recycled Crafts, you will have no problem reusing and repurposing all those soup, tuna, and tomato cans that are stacked up in your garage. 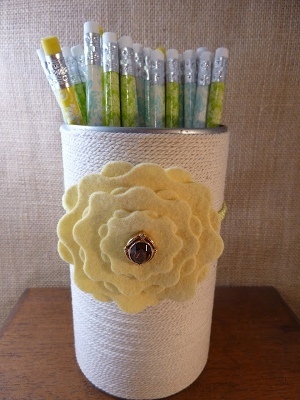 Perhaps one of the simplest ways to reuse these versatile cans is to make a pencil holder. The Soup Can Pencil Holder is a great project that anyone can do, and it’s a fun and decorative way to store your art supplies right out in the open. These recycled pencil holders also make great teacher gifts. Make a set of pencil containers from cans of various sizes and shapes for a one-of-a-kind organizational system that anyone is sure to love. If you’re new to recycled crafting or looking for a simple yet effective way to reuse some old materials, the projects in Trash to Treasure: 28 Recycled Crafts are great to start with! On a cold rainy weekend afternoon, there’s just nothing better than sitting down with a project and sipping a glass of wine. Whether you love paper crafting or knitting, wine is the perfect addition to your crafty afternoon…and when the vino is gone, you can wash out the bottle and craft with that, too! Wine bottle crafts are a great way to spice up your home décor. Both the bottle and the corks are great for recycled crafting, and you’ll love all the fun wine bottle craft ideas we have for you in Trash to Treasure: 28 Recycled Crafts. Super green crafters will love the Green Pendant Wind Chime. This lovely garden craft can be made with 3 glass bottles in various sizes and would look beautiful in any outdoor garden display. If you don’t feel comfortable cutting glass, there are also lots of great ideas for vases, decorations, and peg boards that can be made using the corks of wine bottles. Don’t partake of the fruit of the vine? No worries! 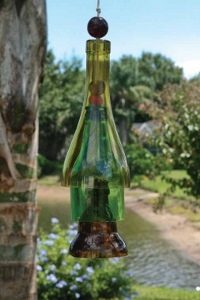 You can easily make these wine bottle crafts with any glass bottle, and you can find corks at almost any craft store. Wine bottle crafts are also great for kids to do with their parents. Cover bottles in yarn, decoupage them with tissue paper, or paint them to create a fun home accent piece that kids will love to show off to family and friends! The start of the New Year and the coming of spring means it’s time to start going through all your old clothes and purging yourself of items you no longer wear. If you have a collection of tee-shirts that no longer fit and are too well loved to be sold at a garage sale or donated to charity, you can upcycle them into brand new wearables with the fun projects that you’ll find in Trash to Treasure: 28 Recycled Crafts. By cutting up old tee shirts, you can create scarves, jewelry, key chains, and more, and you won’t believe how easy they are to make. 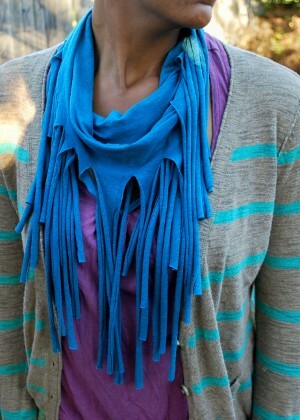 The Tee Shirt Fringe Scarf, which can be found in Trash to Treasure: 28 Recycled Crafts, is a great way to transform an old tee into something new and stylish. You could even add some beads or combine two shirts together to create an accessory that will really stand out. Perhaps one of the most overlooked trash piece is the simple toilet paper roll. Once a roll is gone, you just toss out the cardboard tube, but there are tons of ways that you can reuse that tube and make something to help beautify your home. You can also reuse old juice cartons, ribbon spools, and other cardboard leftovers to make crafty treasures. Best of all, you can find all these ideas in our free eBook, Trash to Treasure: 28 Recycled Crafts. 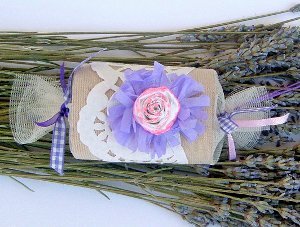 If you’re looking for a clever way to put an old toilet paper roll to use, try making this Paper Tube Lavender Sachet. Made with left over craft pieces, this simple and fun craft is a great gift for all the ladies in your life, and is an easy way to work through that recycle bin and put those random odds and ends to use. You can find this project, as well as several other great ideas on how to reuse cardboard, in Trash to Treasure: 28 Recycled Crafts. Crafting with paper is a fun and easy way to get the whole family in on the fun. Paper plates, paper beads, and coffee filter roses are just some of the fun paper projects that you’ll find in Trash to Treasure: 28 Recycled Crafts. The great thing about crafting with leftover paper is that it’s easily found and so inexpensive to craft with. You can gather up old magazines, newspapers, scraps of papers, and unused paper plates and cups to make all kinds of fun projects with the family. Adults can even enjoy the fun of crafting with paper supplies. These Watercolored Coffee Filter Roses are a little too challenging for kids, but adults can make them by following the simple instructions found in Trash to Treasure: 28 Recycled Crafts. These roses make beautiful indoor decorations and a bouquet of them would be perfect for a wedding or decorations for a bridal shower or baby shower. You could even turn them into a stunning wreath to hang on your front door in the spring! From cute jewelry to colorful home decorations, there’s literally tons of ways you can reuse and recycle all the paper items in your recycling bin, and Trash to Treasure: 28 Recycled Crafts is great for helping you get started. Where would the crafting world be without mason jars? These versatile glass jars can be repurposed for almost anything. They make great storage containers, they can be regifted to hold gift-in-a-jar items, and you could even use them as candle holders or home décor accents. Water bottles also make great crafting material, and you can find awesome ways to reuse and recycle both plastic and glass in our eBook, Trash to Treasure: 28 Recycled Crafts. We know you’re going to love our crafty suggestions for reusing plastic pop bottles, old coffee cans, old spaghetti jars, shampoo bottles, water bottles, and much more. Best of all, you can find all these great ideas in our free eBook. Simply download your own free copy and head out to the garage to see what crafty treasure you can make this weekend. Those who are holding on to all those glass jars for one reason or another will love our Mod Podge Mason Jars. Made with a variety of glass bottles and a collection of fabric scraps, these colorful jars are perfect for storing silverware, paintbrushes, and pens and pencils. They’re easy to make and great for kids rooms, kitchens, and craft areas. Get all the directions, as well as other great storage ideas made from recycled items, by downloading Trash to Treasure: 28 Recycled Crafts today! Still can’t get enough awesome trash to treasure projects? Be sure to check out our section of “Other Great Trash to Treasure Ideas”, found in our free eBook, Trash to Treasure: 28 Recycled Crafts. In this section, you’ll learn how to reuse old keys, jeans, chandeliers, and even CD’s. If you’re like me and you have a stack of old CD’s that are unusable or broken, you’re going to love this clever way to turn those discs into colorful summer coasters. The Recycled CD Coasters tutorial, found in Trash to Treasure: 28 Recycled Crafts, is a fun and easy project that makes a great gift and is a fun accessory for your summer BBQ’s and picnics. Filled with tons of creative ways to turn your trash into treasure, this creative crafting guide will help you declutter your home, organize your living space, and even show you how to make your very own home accents using items that are in your recycling bin right now! So be sure to download our free eBook, Trash to Treasure: 28 Recycled Crafts, today! Alot of your trash can be repurposed into something else quite useful and decorative. Like these tin can jars, they look so adorable. I'd cover mine with twine for a more natural look. You can use that as a desk organizer and a crafting room organizer for your scissors and crafting knives. Dear Sir,br It is wonderful, on reading these craft articles. Now I have some interest on making some craft works like this. So please send your Free book of br " Trash to Treasure Ideas", to my Postal Address. It will be very helpful to me and follow up that things,and it will be useful to my children also. br br I expect your kind reply with your free book soon.br Thanking you,br Yours Truly,br Ravi. i really love this e-book. Thank you for the book.With my kids will do some of these projects during during this summer. Este libro es muy interesante, muy claras las explicaciones y buenas fotografas que hacen fcil la elaboracin de las manualidades. Mis felicitaciones por tan excelente libro. Sounds very interesting.Always looking for trash to treasure ideas. EXCELENTE..!! GRACIAS POR COMPARTIR. ES MUY INTERESANTE LO QUE ES DE RECICLAR Y TODO ES MARAVILLOSO...!! BENDICIONES. Favecrafts is not only a place for inspiration but also makes me to do my projects green(minimum damage of nature). I myself as an art teacher use your new ideas in various sections of handmade items,like part of my teaching programs. Here in iran(persia) the new year(norooz festival)(march 21th) holidays is newly ended and my classes again starts. March 21th is the exact time of starting spring in north hemisphere. Everybody can check it with a geography expert. Due to this reason,it is near to your St.Patricks day. Favecrafts and this new free eBook helps me for a better program in our new year.Thank you and thank all in Favecrafts. I recycle paper, cardboard, plastic, glass, aluminum and metal cans. I should be busy this year! Thank You for the ebook. I love the ideas in the book and the ideas help to inspire other ideas from things normally thrown away. I find myself thinking hard about what I can make out of almost everything I go to throw away, lol. I love the book and thank you again Fave crafts for all the crafts you offer. Love the site. Great ideas and allows you to be creative and think of other ways to use these objects.